Hello! Time for total destruction of all except one! This will be held on Untap.in but the story will be here. 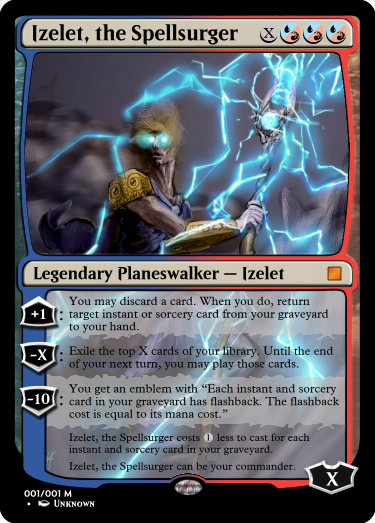 The idea will be to create a deck based around a planeswalker of your creation. You may have only one of any card except basic lands. You will be given choices and options and you will create stories based off of your decks and we will have stories running while the competition goes on. It isn't required to make any stories except your backstory for your deck. For people without untap you can find someone to write a story for! This will start when I decide we have enough people for it. Good luck! Wait so it's commander with duplicates allowed? The idea is in reality there could be multiple people described as a "Boros Raider" but with something like a certain person like "Mara, Boros Raider" there would only be one of them. They can be any number of custom cards and any number of real cards as long as your commander is custom and you have 99 other cards. Any banlist for IRL cards? Current commander banlist and a limit of one other planeswalker in the deck other than the commander. Mariya grew up on Innistrad with a couple other individuals around the time of SOI and lived by the lake the Gitrog Frog inhabited. She was caught up in those events and witnessed the corruption of Mia who eventually became more of a crazed lunatic and somehow got the Frog to attack the town. As a warrior against the unnatural she helped fight back but got wounded in the fight, that's when her spark ignited and threw her into the Blind Eternities and caused her to be stuck somewhere between the Aether and Innistrad in some type of spiritual form, she used this to advantage and followed a figure into what she could only assume was the Markov Manor she had heard about. After following him and witnessing some weird stuff she watched him take a journal and escape. Afterwards she went back to her town and was able to defeat Mia and the Gitrog Frog permanently. About a week later she was able to find the man again and got her hands on the journal, she found many accounts on certain events and figured out about the crazy stuff happening on the plane. She returned the book and helped people from the shadows until the real insanity began. Misshapen and horrific monsters started showing up and corrupting people. This seemed to start happening after that Angel was destroyed. She took a stroll through the woods trying to figure out a plan when she found a warped structure in the woods. So this is what the book meant by a cryptolith. Her magic seems to connect with it and it seemed to lead her to an area directly under the moon. Ugh I don't want to write anymore. Basically this is the rest. She went to Liliana, gained her "Indifference" and somehow talked her into investigating. She than followed crypolith power to where Nahiri was raising Emrakul, vowed to find Nahiri after this and than helped around the plane than after everything finished she met the Gatewatch and pledged to watch over Innistrad. The End. For Now. Izelet liked storms. He stormed once then poofed to another world. The end. Anyway, all joking aside, I'll post my real planeswalker later today. I just wanted to make you aware of how broken a commander game with playsets would be. https://mtgcardsmith.com/view/mariya-tariun-1 Here's the new one. I may join at some point, once I come up with something.